This looks like it's starting to move. Dirt cheap (pun intended) at this level and beginning to get a little attention. Toronto, Canada (January 23, 2018) - Mammoth Resources Corp. (TSX-V: MTH), (the “Company”) is pleased to announce results from the first two diamond drill holes on its Tenoriba precious metal property in southwestern Chihuahua State, Mexico. The results are for two of three planned holes in the El Moreno area, located 1.4 kilometres west of the only holes previously drilled and reported on the property and are the first drill holes ever drilled into the El Moreno area. Results are shown in the table below and drill hole locations and sections illustrating the location and depth of the mineralized intervals relative to the geophysical features and topography of the area are available on the Company's website under the 'Projects' section 'Maps, Images and Photographs' at the following link: www.mammothresources.ca/i/pdf/2018-01-23...ults_Images_PR-1.pdf . * Gold Equivalent wherein silver grade is converted to gold grade at 75 g/t silver = 1 g/t gold. Lengths shown are core lengths versus perpendicular true length of mineralized intersection. Thomas Atkins, President and CEO of Mammoth commented on the initial drill results stating: “We're very pleased with these initial results! The objective of this drilling is to test for the first time the depth extension of surface mineralization along a 6 kilometre trend identified by Mammoth. These initial results begin to confirm the continuity of potentially economical surface mineralization at depth along this trend. "This is the first drilling on the property following 10 of 15 holes drilled in 2008, reporting potentially economical mineralization over 0.4 kilometres of the 6 kilometre trend. These initial intersections of potentially economical gold at the El Moreno area are located 1.4 kilometres west of the area previously drilled. Although these intersections occur at considerable core lengths, vertical depths below surface mineralization are significantly shallower due to the angle of the drill hole and the slope of the ground at these locations. "There remains 50 metres of core still to be sampled from hole TEN-17-02 and although the grade of mineralization in hole TEN-17-02 isn't particularly, what's impressive is the length of the mineralized interval within a suite of rocks that are commonly associated with High Sulphidation systems and which continues to support our belief that there's a robust mineralizing system present at Tenoriba the roots of which remain to be found." The collar position of hole TEN-17-01 was slightly modified from the original drill plan for hole M-01. Hole TEN-17-01 was drilled to test a subhorizontal resistive to moderately chargeable geophysical feature at vertical depths of from 30 to 200 metres below surface which was thought to coincide with the main El Moreno artisanal mine working consisting of an intensely silicified volcanic breccia with the presence of Dickite, Kaolinite and Illite creating to a high ISM index associated with intense hydrothermal activity. Surface samples of the artisanal mine working at El Moreno included chip channel lines grading 2.78 grams per tonne ("g/t") gold equivalent ("gold Eq") over 5.8 metres (where silver is converted to gold at the ratio of 75 g/t silver = 1 g/t gold to arrive at gold Eq grade) and 4.04 g/t gold Eq over 3.3 metres. The company believes the mineralized intersection at TEN 17-01 is an extension of the El Moreno structure extending such structure from surface to 130 to 150 metres vertical depth. This hole replaces the originally proposed holes M-02 and M-04 as it was recognized after drilling hole TEN-17-01 that drilling these holes would be complicated by an area of fault gouging intersected in hole TEN-17-01. TEN-17-02 targeted a large high resistivity feature at intermediate depths and a chargeable body towards the end of the hole. The high resistivity feature intersected from 65.90 to 182.60 metres coincides with a variably weakly to moderately silicified altered tuff containing 3 to 7 percent disseminated pyrite and pyrite veinlets. Only a few intervals from this interval returned less than 0.2 g/t gold Eq. The chargeable feature from 182.60 to 295.80 metres coincide with an altered Feldspar Porphyry unit generally moderately to weakly silicified and argilized with local strong silicification containing on average of 3 to 7 percent disseminated pyrite and pyrite veinlets and locally up to 15 percent pyrite and 3 to 5 percent up to 10 percent disseminated tourmaline in narrow pyrite bearing veinlets and veins up to 30 centimetres thick. Sampling of this interval assayed 80 metres at 0.18 g/t gold Eq with an interval of 9.0 metres grading 0.52 g/t gold Eq. Tourmaline alteration zones are common in High Sulphidation mineralizing systems although they generally tend to occur in locations more distal to the core of the system and generally are free of precious metals. This 80 metre thick interval grading 0.18 g/t gold Eq would therefore appear to indicate the strength and potential of the mineralizing system present at Tenoriba and that this system likely occurred over repeated pulses. Drilling recommenced at El Moreno following the holiday break with a third hole collared 100 m east of TEN-17-01 testing this same structure. 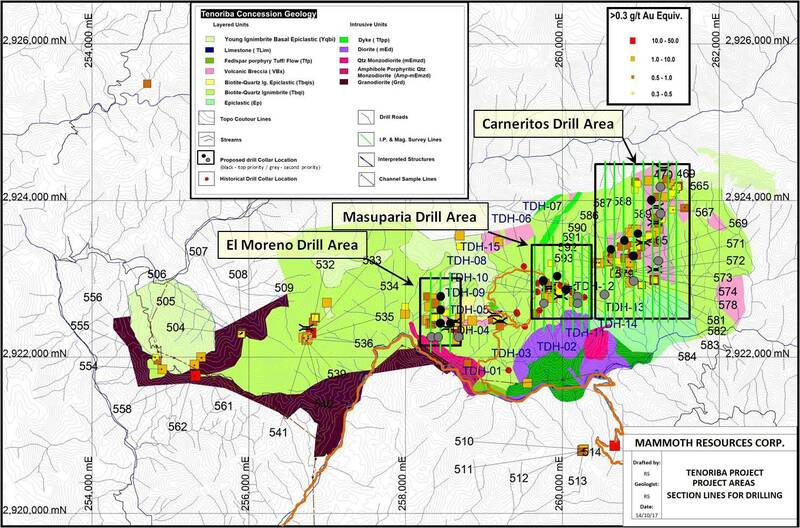 Following drilling at El Moreno the company plans to test features near the area previously drilled in 2008 and will then move further east to test targets in the Carneritos area, in total drill testing approximately 5 kilometres of the 6 kilometre trend. Richard Simpson, P.Geo., Vice-President Exploration for Mammoth Resources Corp. is Mammoth's Qualified Person, according to National Instrument 43-101, for the Tenoriba property and is responsible for and has reviewed any technical data mentioned in this news release. Samples referenced in this press release were prepared and analyzed by ALS CHEMEX in their facilities in Mexico and Canada, respectively. Samples generally consisted of a minimum of 2 kilograms of material. Drill core is mostly HQ diameter core with minor lengths of NQ diameter core. Where samples are taken these are most often 1.0 to 1.5 metres in length and the core is sawn in half with a rock saw, samples bagged and ticketed with individual sample bags sealed with a nylon ziplock and then loaded into grain sacs which are further sealed with a nylon ziplock and then transported by Mammoth personnel to Chihuahua, Mexico for preparation. Gold and silver analyses are performed by 30 gram fire assay with an Atomic Absorption finish. Silver, copper, lead and zinc were analyzed as part of a multi-element ICP package using an aqua regia digestion. Over limit samples with greater than 1% Cu, Pb and Zn were re-analyzed using ore grade detection limits. Blank and duplicate samples were inserted randomly at approximately every 20 samples. To find out more about Mammoth Resources and to sign up to receive future press releases, please visit the company's website at: www.mammothresources.ca . Mammoth Resources Corp. has closed its previously announced non-brokered private placement of up to eight million units of Mammoth at nine cents per unit, for gross proceeds of up to $720,000. Each unit consists of one common share and one common share purchase warrant of the company. Each warrant will entitle the holder thereof to acquire one common share up to 18 months following closing of the private placement, at an exercise price of 13 cents. The gross proceeds of the private placement will be used to diamond drill up to 3,000 metres testing up to 24 targets along a five-kilometre trend of gold-silver mineralization at the company's Tenoriba high sulphidation gold-silver project in the Sierra Madre region of southwestern Chihuahua state, Mexico (refer to press release dated Oct. 25, 2017), and for other working capital purposes. The company commenced diamond drilling on Dec. 1 and has competed the first drill hole and begun drilling the second of the program (please refer to company website for drill photographs from the project). Drilling is expected to continue nearer the holiday period whereupon drilling will be curtailed for the holiday and recommence in early January. It is expected that the company will have results from holes drilled in December, in early to mid-January, and results from the continuation of drilling in 2018 will be released through the first quarter 2018. Thomas Atkins, president and chief executive officer of Mammoth, commented on this successful private placement, stating: "We're pleased to be closing on 100 per cent of what we'd set out to raise through this financing and in fact we couldn't accept additional investment due to the limits of our price reservation. We're also pleased to announce that even prior to closing this financing we began diamond drilling and are pleased to so quickly be able to mobilize and start drilling relative to the announcement of our plans to fund drilling via this private placement. Mammoth's vice-president, exploration, Richard Simpson, is on site and working with the drill contractor and local labourers to advance this drill program. Results are expected early to mid-January and throughout the first quarter of 2018. We're optimistic the abundant surface work performed by the company, and which was used in selecting the drill targets, will produce some attractive precious metal intersections from this drilling." Mammoth Resources is a mineral exploration company focused on acquiring and defining precious metal resources in Mexico and other attractive mining friendly jurisdictions in the Americas. The company has an option to acquire 100 per cent in the Tenoriba property located in the Sierra Madre precious metal belt in southwestern Chihuahua state, Mexico, and is seeking other option agreements in the Americas on properties it deems to host above average potential for economic concentrations of precious metals mineralization. Zonte Metals Receives Buy Recommendation from Fundamental Research. Vancouver, British Columbia--(Newsfile Corp. - December 7, 2017) - Today's buy recommendation comes from Fundamental Research Corp. Analyst Sid Rajeev gives Mammoth Resources (TSXV: MTH) a buy rating and a fair value estimate of $0.41 per share, a premium of 412% to the $0.08 closing price on November 21st, the day the report was issued. Mammoth's flagship asset is the Tenoriba property located in the heart of the Mexican Sierra Madre, in southwestern Chihuahua State, Mexico. InvestmentPitch Media has produced a "video" which discusses this company. If this link is not enabled, please visit www.InvestmentPitch.com and enter "Mammoth Resources" in the search box. The Sierra Madre Occidental range includes one of the world's largest precious metal regions, running from southeast Arizona, U.S., to Guanajuato, Mexico, a distance of 1,500 kilometres. It has been mined for hundreds of years, with the region hosting several well-known mines and advanced stage deposits. The Tenoriba property, covering 5,951 hectares, is comprised of four concessions. The property was previously drilled in 2008 by a predecessor company. Of the 15 holes drilled, 10 holes reported potentially economical gold intersections, with the best results being 45.9 grams per tonne over 1.9 metres, 2.26 grams per tonne over 11.5 metres, 1.03 grams per tonne over 34.4 metres, including 2.82 grams per tonne over 7.4 metres. The longest intersection graded 0.5 grams per tonne over 66 metres. Analyst Sid Rajeev stated: "The property has a long history of artisanal mining, but limited modern exploration. Based on the historical work performed on the property, which included surface mapping, sampling, soil and rock geochemical analysis, and drilling, the project shows all the characteristics of a high sulphidation precious metal system covering a large 15 sq. km area. (5 km by 3km). The system remains open to the west and east". In September 2017, the company announced results of the trenching program, which showed an average of 0.77 grams per tonne gold equivalent over 129 metres in 12 of the 14 channel samples collected over the 5-kilometre strike length. Mammoth anticipated beginning its diamond drill program around the first of December. The program of 8 to 24 holes, and up to 3,000 metres, will test various high priority gold-silver targets along a 5-kilometre strike length within an approximate 15 square kilometre area of ubiquitous gold mineralization. The estimated budget of the program is $500,000, with the drill contractor agreeing to accept a portion of his costs in shares. Thomas Atkins, President and CEO, recently stated: "Although I doubt we'll finish the entire program before year end, whatever portion continues into the new year there should be a steady supply of drill results flowing beginning in January and continuing for a number of weeks into 2018. We believe we've been quite diligent in our analysis of all the available information at our disposal to select what we believe are some of the most attractive drill targets on the property coincident with some very compelling features of a High Sulphidation precious metal system observed at the project. This includes abundant gold-silver mineralization in surface sampling and in 10 drill holes covering approximately 15% of the property from a 2008 drill program. Although we have no idea what gold-silver grades we'll intersect over what intersection intervals we do feel confident we'll intersect gold-silver mineralization in these holes." Management and board members hold 2.81 million shares, or 13.5% of the total outstanding shares. Toronto, Canada (November 22, 2017) - Mammoth Resources Corp. (TSX-V: MTH), (the “Company”) is pleased to announce that all drill equipment and a D6 Caterpillar bulldozer has been mobilized to its Tenoriba, High Sulphidation gold-silver exploration project in the Sierra Madre region of southwestern Chihuahua State, Mexico. Equipment has arrived on truck in preparation to commence the Company’s previously announced (refer to press release dated October 25, 2017) 8 to 24 hole, up to 3,000 metre diamond drill program to test various high priority gold-silver targets along a 5 km strike length within an approximate 15 square kilometre area of ubiquitous gold mineralization at Tenoriba. The Caterpillar bulldozer will be finalizing previously advanced access to diamond drill stations that were unable to be completed earlier this year. Drilling is expected to begin in the next 7 to 10 days once the diamond drill contractor has completed all preparation work (drill water supply lines, other supplies to drill stations) to enable commencement and continuation of drilling. Thomas Atkins, President and CEO of Mammoth commented on the imminent commencement of drilling, stating: “We should begin our first drill hole shortly and although I doubt we’ll finish the entire program before year end, whatever portion continues into the new year there should be a steady supply of drill results flowing beginning in January and continuing for a number of weeks into 2018. Mammoth’s VP Exploration, Richard Simpson is on site and working with the drill contractor and local labourers to advance this drill program. We believe we’ve been quite diligent in our analysis of all the available information at our disposal to select what we believe are some of the most attractive drill targets on the property coincident with some very compelling features of a High Sulphidation precious metal system observed at the project. This includes abundant gold-silver mineralization in surface sampling and in 10 drill holes covering approximately 15% of the property from a 2008 drill program. Although we have no idea what gold-silver grades we’ll intersect over what intersection intervals we do feel confident we’ll intersect gold-silver mineralization in these holes. Mammoth has targeted its drill holes based on what it believes is a compelling combination of: (1) surface geology, (2) trace element geochemistry, (3) gold bearing samples from chip and cut channels over a large 15 square kilometre area of gold mineralization, (4) PIMA sampling results indicating proximity to high temperature geothermal activity coincident with surface gold values, and (5) a ground Induced Polarization (IP) and Magnetometer (Mag) geophysics survey which illustrates attractive geophysical features at depth coincident with surface gold mineralization, artisanal workings and in some cases intersected at depth by a predecessor company’s drilling (the highest grade intersection assaying 45.9 grams/tonne gold over 1.9 metres in drill hole 7 and the lengthiest gold intersection assaying 34.4 metres grading 1.03 grams/tonne gold in drill hole 11 and 66 metres grading 0.5 grams/tonne gold in drill hole 14) (for additional information on these results please feel free to reference the technical reports available on the Company’s website at the following link: www.mammothresources.ca/s/TechReports.asp .). Mammoth will be posting a technical report later today which discusses and illustrates the criteria for its drill target selection. This report will be available in the “Technical Reports” section on its website. The Company welcomes anyone interested in acquiring greater understanding or appreciation of the potential of the Tenoriba property and the characteristics of its drill program to visit its web site and view this report.
" The Price is Right "
The small float of 21M is excellent for a junior ! .... I will be particpating in the pp. Mammoth doing a small raise at nine cents with a full warrant at 13 cents. U.S. Global (Frank Holmes) has taken $100,000 of it and Julius Baer Precious Metal Fund has taken $125,000. Drill program starting next week. Good time to get a piece of this through Ron if interested. Toronto, Ontario--(Newsfile Corp. - October 25, 2017) - Mammoth Resources Corp. (TSXV: MTH) (the "Company"), is pleased to announce a diamond drill program from 8 to 24 high priority targets planned to commence in November 2017 on its Tenoriba gold-silver property in Chihuahua State, Mexico (the project was drilled by a predecessor company in 2008 which reported gold intersections in 10 of 15 holes drilled). Mammoth has targeted its drill holes based on what it believes is a compelling combination of: (1) surface geology, (2) trace element geochemistry, (3) gold bearing samples from chip and cut channels over a large 15 square kilometre area of gold mineralization, (4) PIMA sampling results indicating proximity to high temperature geothermal activity coincident with surface gold values, and (5) a ground Induced Polarization (IP) and Magnetometer (Mag) geophysics survey which illustrates attractive geophysical features at depth coincident with surface gold mineralization, artisanal workings and in some cases intersected at depth by a predecessor company's drilling (the highest grade intersection assaying 45.9 grams/tonne gold over 1.9 metres in drill hole 7 and the lengthiest gold intersection assaying 34.4 metres grading 1.03 grams/tonne gold in drill hole 11 and 66 metres grading 0.5 grams/tonne gold in drill hole 14) (for additional information on these results please feel free to reference the technical reports available on the Company's website at the following link: www.mammothresources.ca/s/TechReports.asp .). Mammoth intends to post a technical report on its drill target selection at the same "Technical Reports" location on the website in the coming days. A number of these drill hole locations are discussed and illustrated in the following commentary. Thomas Atkins, President and CEO of Mammoth commented on the drill targeting stating: "We've completed the consolidation of all surface results from the various exploration activities on the property. This work has enabled Mammoth to identify what we feel are the most compelling drill targets to test gold mineralization over an approximate 6-kilometre strike length of surface gold mineralization within the High Sulphidation, precious metal mineralizing system at Tenoriba. "A unique feature to some of the proposed targets is they occur as extensions or within geological features where prior drilling intersected gold over tens of metres. At the time of the earlier drilling, those undertaking this drilling didn't have the benefit of the geophysics survey recently completed by Mammoth. The geophysics survey which covers half of the property gives information on the characteristics of the geology below surface in areas where favourable surface geology and hundreds of gold samples have been collected over a large 15 square kilometre area of mineralization, the highest grade of which assayed 74 grams/tonne gold, with another approximate 10 samples averaging from 10 to 47 grams/tonne gold. 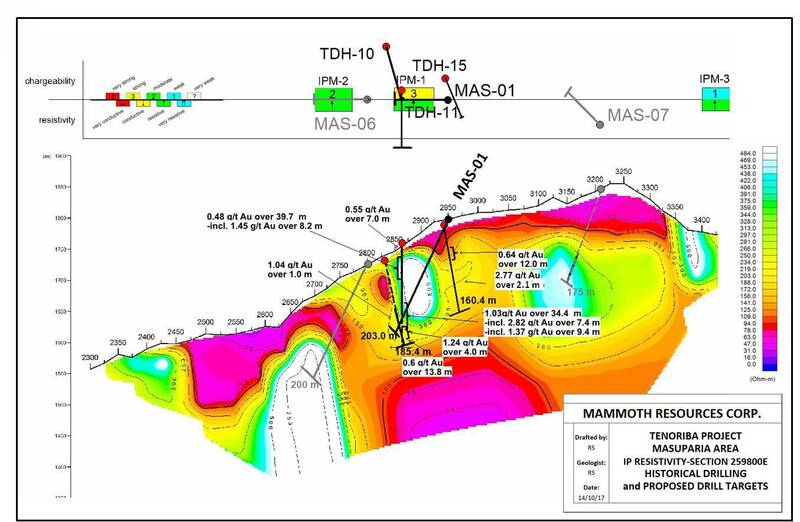 "Mammoth believes there is excellent potential for success in the proposed drill program given the combination of the surface geology and gold values correlating with geophysical features at depth, and especially where earlier drilling intersected gold over tens of metres in similar geophysical features as those targeted in the Company's proposed program." The Company plans to drill from 3 to 7 diamond drill holes in each of the El Moreno and Masuparia areas and from 5 to 10 drill holes in the Carneritos area for a total of from 8 to 24 high priority drill holes (refer to drill collar locations; black being top priority drill locations and grey additional high priority targets in Figure 1 - Surface Plan, Proposed Drill Collar Locations). The Tenoriba project is fully permitted with surface access agreements in place for the immediate commencement of drilling. The drill contractor has been selected and is finalizing details of mobilization to the project area and has elected to accept up to 60% of the cost of the proposed program (to a maximum of less than 10% of the outstanding shares of the company) in shares of Mammoth, subject to TSX approval. Petrographic analysis of gold at Tenoriba indicates its occurrence as free gold. Bottle roll testing on samples collected at various depths and grades from drill core from the prior drilling resulted in 100% gold recovery in less than 24 hours to a vertical depth of 60 metres and recoveries of 65% to 70% in 72 hours to depths of 125 metres (the deepest core depth available). Subject to more extensive testing and verification it would appear from these results that gold at Tenoriba may be recoverable by low cost heap leaching methods implying the potential that should an economic resource be discovered at Tenoriba this resource may be amenable to low cost open pit mining and heap leach gold recovery. From 3 to 7 drill holes are targeted in the Masuparia area located near the middle of the approximate 6-kilometre trend of gold mineralization at Tenoriba (refer to Figure 1). Section 259800E - IP resistivity geophysics section (refer to Figure 2 - Masuparia Area IP Resistivity Section with Historical and Proposed Drilling), illustrates the trace of the proposed drill hole MAS-01 together with prior drilling (another 2 high priority drill holes are planned for this area). The areas of highest initial interest within the 600 metres east-west area covered by the geophysics survey is focused on gaps near prior drilling within and along an approximate 750 m long northwest trending corridor of gold mineralization and where there are a number of artisanal workings, portions of which were intersected by 7 prior drill holes, including TDH 11 and 15 along this section in which TDH 11 intersected 39.7 metres grading 0.44 g/t gold and 34.4 metres grading 1.03 g/t gold and TDH 15 intersected 12 metres grading 0.64 g/t gold in areas indicated by high resistivity in the IP geophysics. From 3 to 7 drill holes are targeted in the El Moreno area located approximately one kilometre east of the western end of the 6-kilometre trend of gold mineralization at Tenoriba (refer to Figure 1). Section 258400E - IP resistivity geophysics section (refer to Figure 3 — El Moreno Area IP Resistivity Section with Historical Sampling and Proposed Drilling), illustrates the trace of proposed drill holes M-01, M-02 and M-04 testing high resistivity (white through light blue to light yellow colours on section) targets to depths of in excess of 100 to 200 metres where surface geology, sampling results, including 5.8 metres grading 2.78 g/t gold, 3.3 metres grading 4.04 g/t gold and an 8.5 metre long channel which averaged 0.86 g/t gold and extensive artisanal workings are prominent. Another diamond drill hole 100 metres east of these holes will result in a total of 200 metres of strike length being tested in this area, the surface and geophysical features remain open to the east towards the Masuparia area while to the west these features could extend at least one kilometre to the Cerro Colorado area where gold has also been sampled on surface. From 5 to 10 drill holes are targeted in the Los Carneritos area located at the eastern end of the 6- kilometre trend of gold mineralization at Tenoriba (refer to Figure 1). Section 261200E - IP resistivity geophysics section (refer to Figure 4 - Los Carneritos Area IP Resistivity Section with Historical Sampling and Proposed Drilling), illustrates the trace of proposed drill hole CAR-01 testing high resistivity (white through light blue to light yellow colours on section) from surface to a vertical depth of approximately 150 metres where favourable surface geology and sampling results, including: 15.75 metres grading 1.07 g/t gold, 7.2 metres grading 1.6 g/t gold and a 5 by 5 metre 67 sample grid averaged 0.56 g/t gold. Another 4 top priority diamond drill holes are targeted for this area and another 5 high priority targets are planned to test an area approximately 600 by 1,200 metres in this area to depths of in excess of 100 metres. Richard Simpson, P.Geo., Vice-President Exploration for Mammoth Resources Corp. is Mammoth's Qualified Person, according to National Instrument 43-101, for the Tenoriba property and is responsible for and has approved all scientific and technical data mentioned in this news release. Wondering if the company will be drilling their Tenoriba property in 2017 ? I may have to pick up some more before $0.10 + and any announcments.